Norfolk may not get harsh cold weather conditions compared that we see in other places, but there are still often hazardous conditions on our roads during winter that we should prepare for. Make sure you keep vital supplies in your car. We recommend the following: Blanket or extra clothes to keep you warm, food and water, a torch, a shovel and ice scraper and a first aid kit. Always ensure you have a full tank of fuel. The bad weather can cause long delays so the last thing you want is to be sat in traffic worrying about how much fuel you have left! Keep it filled up to get yourself home safely. Check the tyre tread – the tyre tread needs to be at least 3mm to provide the right amount of grip. If you have some extra money, it can also be worth investing in some winter tyres from our service centre we have located on site! 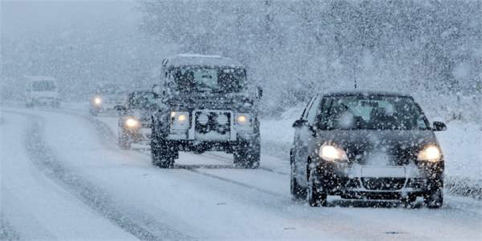 Ensuring you take extra care when driving is needed in the winter months. Avoid sudden movements and always ensure you leave a bigger gap between you and the vehicle in front can also reduce the chances of a collision if you were to skid whilst braking. Sticking to busier roads is a good idea in wintery conditions. They’re more likely to be free of ice/snow due to the amount of cars already driven on it and are the first to be serviced by a gritter. Quiet roads are more likely to see snow/ice build ups. Ensure your windscreen is FULLY defrosted before setting off – We’ve got a range of cars here at spencers used car sales that come with heated windscreens which is a perfect way to clear your screen so you have clear vision at all times! We’re currently stocking a great range of used cars at here at Spencers Car Sales which are ideal for all year round use including driving in winter conditions! 7 Seats, Navigation, Bluetooth, Heated leather seats, DAB plus much more! The BMW X5 was one of the first big 4x4s to prioritise on-road performance over off-road abilities, setting a template that’s now become the norm. Parking sensors, Electric Folding mirrors, Privacy plus much more! The Audi Q5 is only in its second generation, but it is firmly established as one of the most popular premium SUVs on the market – a very solid rival for the likes of the BMW X3 and Mercedes GLC. Navigation, 7 Seats, Rear entertainment screens, triple glass sunroofs, Heated front & rear seats plus much more! The Discovery is an exceptionally versatile vehicle: a grade-one off-roader, proper seven-seater and rapid and luxurious way to cover distances.